I received products free of charge in exchange for an honest review. The holidays are a wonderful time of year, but can also be tough. I am already feeling stressed, but I am trying to stay on track by pacing myself, getting enough sleep, and eating a balanced diet. The holidays are a great time to splurge on treats, but that doesn’t mean you can’t stick with organic, natural products like Santa Cruz Organics. I fully believe in enjoying holiday goodies like sweets – but simply looking for natural ingredients and indulging in moderating. Santa Cruz has a variety of natural, organic products, from juices to peanut butter, fruit pouches to chocolate syrup. One of the things that stresses me out during the holidays is all the junk food loaded with food dyes, artificial flavors, and more, so I can feel better when I buy Santa Cruz products and not worry about undesirable ingredients. One way to have fun with our organic Santa Cruz products are some baking projects. 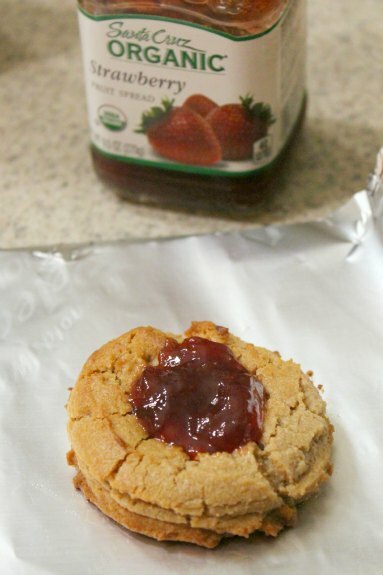 We decided to make these Peanut Butter Thumbprint Cookies with Santa Cruz Organic® Dark Roasted Creamy Peanut Butter and Strawberry Fruit Spread. I have never actually made thumbprint cookies before, so I was a little worried if I would be able to do a good job, but they came out perfect! 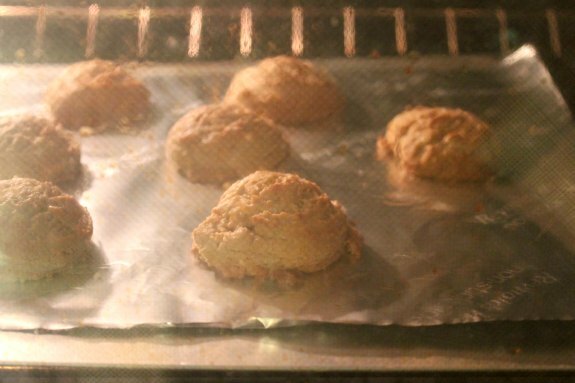 The recipe is pretty easy, and the kids eagerly kept an eye on the cookies while they baked. 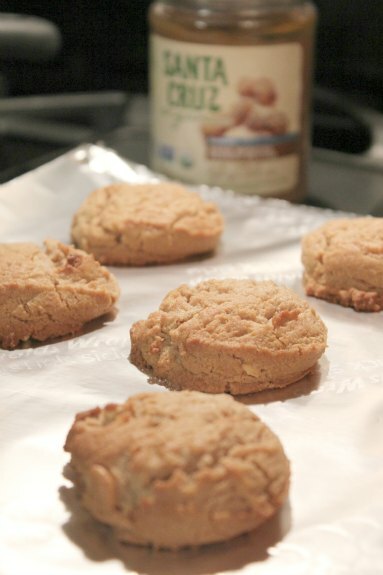 It was fun to add the Santa Cruz Organic Fruit Spread after the cookies had cooled. We chose the Strawberry Fruit Spread, but you can choose any flavor. Or use a variety for a pretty assortment of colors and flavors! These cookies are absolutely delicious and were a lot of fun to make. I love that the ingredients list is simple and I was able to use all natural, organic ingredients. 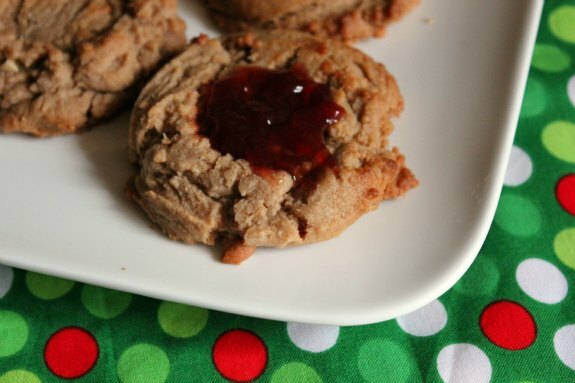 Although the thumbprint cookies are a hit with my one daughter, I knew my other would want hers plain, so we made a batch without the fruit spread. She was happy to have her own set of cookies! Get your fruit on – Even though the winter months are ahead, eating a variety of fruits and veggies is still the best way to get a wide range of nutrients. Organic fruit is the first ingredient in Santa Cruz Organic Fruit Spreads, making it a better-for-you topping option. Jump for joy – Get moving this holiday season with fun activities the whole family can enjoy. Sign up for a holiday run or walk in your area or visit your local ice-skating rink. Go certified – Choose Certified Organic products to make a holiday meal that’s good for your family and for the planet. Santa Cruz Organic offers more than 60 great tasting USDA Certified Organic products, so you can create a delicious organic holiday meal from start to finish. Treat yourself! – An organic holiday is all about balance. 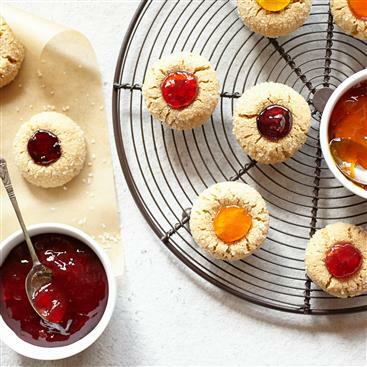 Feel good about treating yourself and your family with recipes like the Thumbprint Cookies. One of my own tips: it is fine to splurge on treats, but remember portion control. I use one of my kid’s snack bowls for things like ice cream, chips, or cookies so that I don’t sit there eating from a bag or scoop too much ice cream. You can purchase Santa Cruz at a variety of stores – use the locator page to find a retailer near you! I have to make these cookies. They look so delicious and fun to make. I love Thumbprint cookies. I love thumbprint cookies. 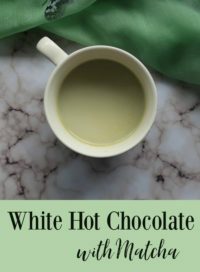 Thanks for posting this healthier alternative recipe. I have seen these Santa Cruz jellies in the store, but have never tried them. I am going to have to check them out. I love that they are organic, as I only eat organic jellies.